There may be times when an author needs to make an edit to their submission, whether it be an author name change, or a typo, and they can't because the deadline has passed. In these cases, you can make the edits on behalf of the authors, as your admin role allows you to override the deadlines at any time. No matter what stage of the conference process you are in, to find the submission you are looking for, you must first navigate to the Submissions hub, as below. Once you click on the Submissions hub, you will be brought to the list of submissions. To find the submission, you can search either by its title, its ID or any of the authors names. Once you've found the submission you need to edit, click on the title, as in the image below. 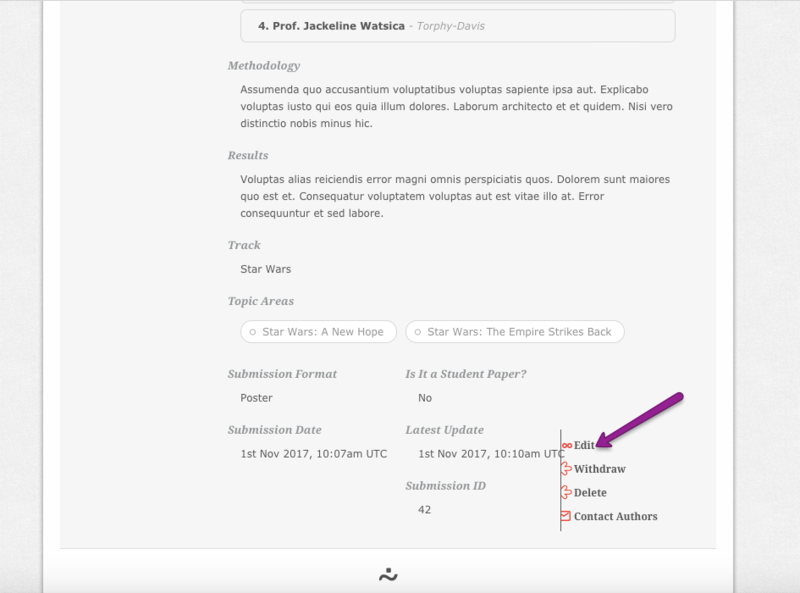 This will expand the view of the submission, and will allow you to select 'Edit' at the bottom right of the view. Clicking this will bring you into the workflow, allowing you to make the necessary changes. When in the workflow, you will see a view similar to the below image. On the left hand side, you will see a tab for each step of the process - this may differ depending on your own settings, but will look essentially the same. 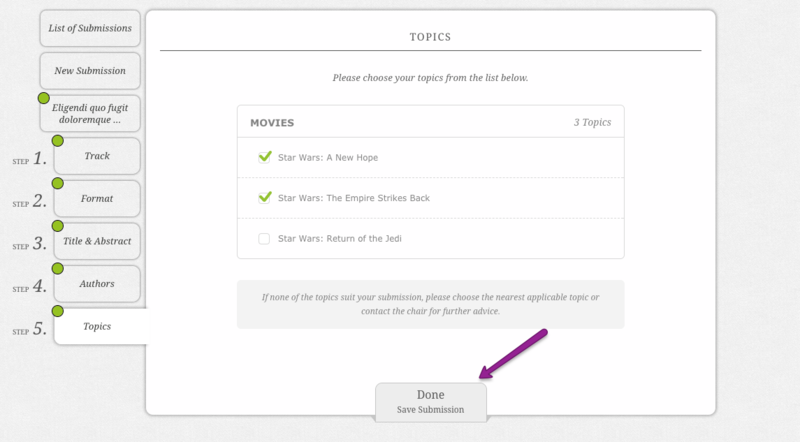 Navigate to the step where you need to make edits simply by clicking on the step. If you are making changes to the author details, select the Authors step. if you need to make changes to the abstract, go to the Title & Abstract step. When all your edits are complete, navigate to the last step in the workflow - in this case Topics - and select 'Done - Save Submission' to save your progress. Now your edits have been saved and the submission has been updated for its authors.